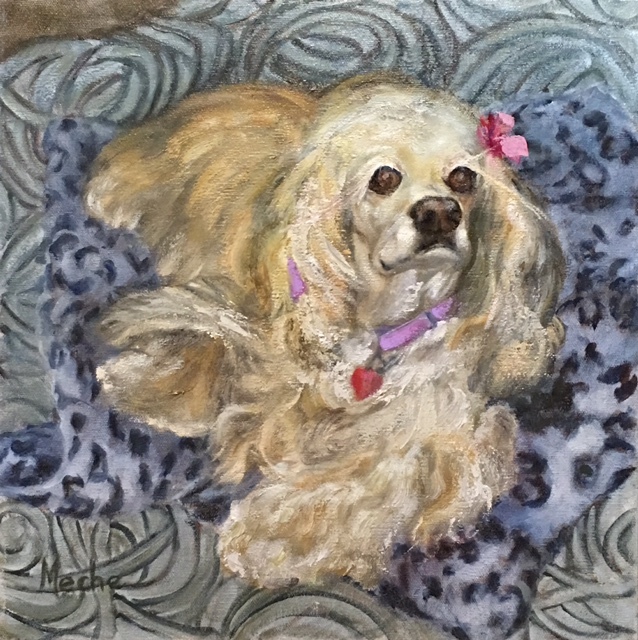 Home > Meche-Art > View Continuous Catalogue-All Paintings > "Prettiest Cocker Ever"
Dog Portrait, Oil Painting on Canvass, Cocker Spaniel, "Prettiest Cocker Ever", 14x14, by Mercedes Franklin. Private Collection. My aunt had 3 cockers all different colors. Enjoyed their long soft & silky hair. I can remember how they were always very busy. Don't really remember what they were busy doing but whatever it was kept them very busy.